St. George, the county seat of Washington County, is the largest of all the towns founded during the LDS Church's Cotton Mission of 1861. 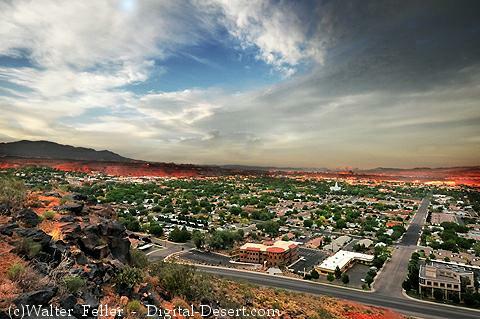 Located in the southwest section of Utah at an elevation of 2,880 feet above sea level, St. George has an average annual temperature of 59.9 degrees with summer temperatures well into the 100s and the average maximum winter temperature around 55 degrees. The average annual rainfall is 8.30 inches, and the normal growing season is 196 days. All these factors made the area a suitable location for the early settlement. By 1854 the LDS Church had established an Indian mission at Santa Clara, two miles north of the St. George Valley. In 1857 and 1858 experimental farms were set up to the east and west of where St. George was to be built. While touring the experimental desert farms in May 1861, Brigham Young predicted the settling of the area. Five months later, in October 1861, 309 families were called by church authorities to what was called the Cotton Mission. Most of those sent had abilities that were deemed essential to establishing a successful community. St. George itself was named in honor of George A. Smith, who, although he did not participate in the town's settlement, had personally selected most of the company of the pioneers of 1861. The first years in the new outpost were difficult. Great rainstorms almost destroyed the farmlands, and intense summer heat and lack of culinary water made life far from pleasant. In 1863 St. George became the county seat for Washington County. That same year the construction of the St. George LDS Tabernacle began. It was completed in 1875. Before the tabernacle was completed, on 9 November 1871 work commenced on the St. George LDS Temple. Construction of the temple was a cooperative effort of many communities in southern Utah. The area was suffering from a monetary depression, and a work project was needed in which employment would mean food for families. The building cost $800,000 and was dedicated on 6 April 1877. Other important area buildings from the pioneer era include the historic courthouse (1870) and the social hall and opera house (1875). The community is served by six local radio stations, a local daily newspaper, The Daily Spectrum, and an airport with commercial connections to Las Vegas and Salt Lake City. See: Larry Logue, A Sermon in the Desert: Belief and Behavior in Early St. George (1988); A. Karl Larsen, I Was Called to Dixie (1961); Washington County Chapter, Daughters of Utah Pioneers, Under The Dixie Sun (1950).